Costs vary significantly depending on location, but the average cost of the funeral itself now stands at £3,456, 80% higher than when the survey was first conducted in 2004. The average burial costs £3,914, almost £1,000 more than the average cremation at £2,998.The average cost of dying in the London area now stands at a staggering £9,556, while the least expensive place to die is Wales where the average cost stands at £6,096. Discretionary funeral extras are also up by £83 to £2,006, with the cost of a memorial accounting for a large part of this (43%) at £864. These rises come as research reveals many continue to struggle with funeral costs. Almost one in five people who have organised a funeral in the past four years struggled, with the average shortfall rising from £1,246 to £1,277 year on year. Total funeral poverty (the national funeral funding shortfall) now stands at just over £131m. 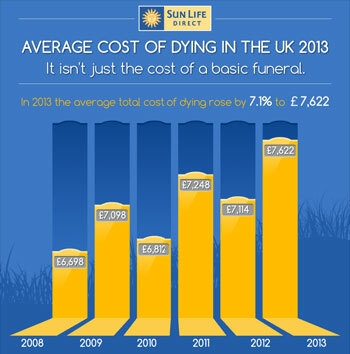 Sun Life Direct expects funeral costs to continue to rise significantly and prove unaffordable for many more. “An important message for everyone should be to do something to prepare, however small,” said Melanie Rees, head of brand at Sun Life Direct. “The death of a loved one is a difficult time, and is only compounded by financial worries over how to pay for the funeral. Drawing on savings can be one way to cover the cost. However, as funeral poverty stands at just over £131m, savings are clearly not an option for everyone. “In old age, savings can deplete; advising people to rely on money they may not even have is irresponsible and more financial options should be available. As funeral poverty has increased 50% in just three years, something must be done as a matter of urgency before more families are unable to give their loved ones the send-off they deserve”. Dr Kate Woodthorpe, lecturer in Sociology at the University of Bath, said: “It is disappointing that the number of people who struggle to afford a funeral shows no sign of abating. Funeral poverty has increased more than 50% in the last three years and it is likely that this will continue. “The notable postcode lottery of funeral costs, especially in terms of cremation and burial costs, is particularly troubling. People need to realise that death is one of the few certainties in life and must be addressed ahead of time so that plans can be made with regard to who will pay for their funeral, and how.